Spain, of Clarksville, TN drove in nine of the Govs 19 runs during its three-game league series against Morehead State. The freshman batted .462 (6-for-13) during the series with a double and two home runs. 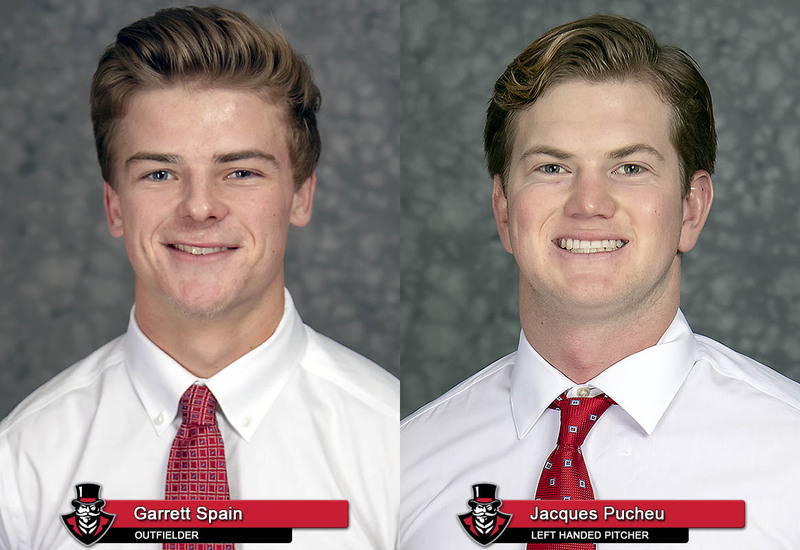 Spain opened the Morehead State series with a three-run double that gave APSU the lead for good in its series-opening win. He followed that with a walk-off RBI fielder’s choice in Game 2 of the series. Spain wrapped up the series with a three-run home run in Game 3 that provided APSU its only runs of the game. Pucheu, of Gulfport, Mississippi, wins his third OVC Pitcher of the Week honor, each following successive home outings. The senior left-hander tossed the Govs first complete game since 2017 – and one of five in the OVC this season – in Friday’s series-opening win against Morehead State. After battling through his roughest outing a week ago at Eastern Kentucky, Pucheu bounced back impressively, holding Morehead State – the OVC’s top hitting team – to six hits and three walks. He began the game by retiring the first 10 batters he faced. He surrendered his lone run in the fifth inning, but stranded two runners on base in the frame. Pucheu closed the game in strong fashion, posting five of his eight strikeouts in the game’s final four innings, including two in the ninth inning. Pucheu shared this week’s pitching honor with Belmont freshman Joshua Smith who tossed a complete-game win against Jacksonville State. Austin Peay returns to action when it wraps up its five-game homestand with a 4:00pm, Tuesday contest against Southern Illinois. Tickets for the game may be purchased online at LetsGoPeay.com/buytickets.